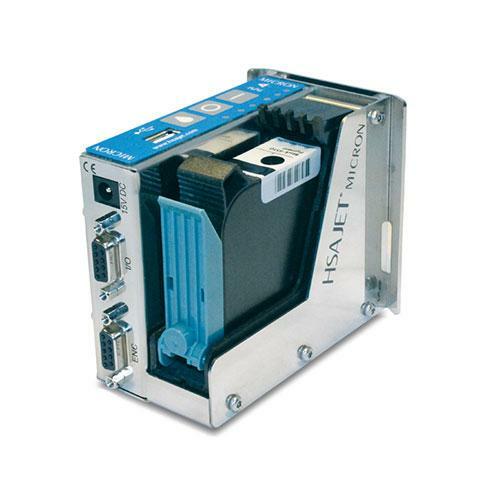 Home / Packaging & Advertising > Printing > Printing Accessories & Supplies > Printing Controllers / MICRON MCHP1 ½"
Our Micron printer is a controller that is ideal for integration on various production lines where a low cost solution is required. Use the Micron for printing graphics, counters, date & time (real-time & adjusted), text, barcodes (fixed) and three variable lines. The Micron runs with 1 HP print cartridge allowing a print height of 12,7 mm. Print in 300 DPI at 76 m/min or 150 DPI at 152 m/min. The horizontal DPI resolution is variable from 75 to 600 DPI. The software allows full access to adjust voltage settings for inks, so there are no limitations in using special inks if needed. The Micron printer takes up very little space, which makes it very easy to integrate. Print horizontally or simply change the position of the printer 90º for printing vertically/down. Build your print job on a PC, transfer to USB-key, connect to the Micron and you are now ready to print. The layout can be saved to the internal memory and the USB-key may be removed. The Micron has a built-in sensor. If an external sensor or encoder is required they can be connected directly to the printer.